Making meaning of feedback data – transforming it into insights that can support good decisions and actions – is hard work. In doing this work we often get caught up in limited perspectives and emotional reactions. We hastily jump to conclusions. We get triggered by a particular phrase that hooks our attention, and in the process we miss something else really important. We need to overcome our tendency to defend and deflect feedback that does not match our perceptions of ourselves. Left to our own devices, we tend to “read” feedback in ways that skew it. This is why it is good to have a coach as a thinking partner when your do the hard work of reflecting, parsing, connecting the dots, and eventually deciding how to respond to feedback. Making sense of feedback requires taking multiple perspectives, looking at the feedback in different contexts and through different frames. The leader’s role, the organization’s direction and current challenges, the culture and climate of the organization, the styles and personalities of the other leaders – all this and much more comes into play when we work to make sense of feedback, positive or not. 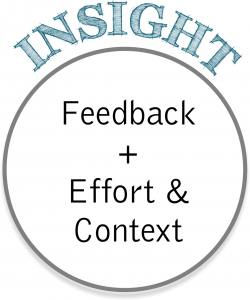 Invest adequate time and effort into making sense of feedback. Resist the tendency to make quick and hasty interpretations without a thoughtful reflection through a number of different frames. As you process feedback from others, be aware of the particular leadership frame through which you are looking. Use this as an opportunity to become aware of your frame, and where needed to shift your frame. Similarly, when others ask you for feedback, use this as an opportunity to consider what your own frame and expectations are for effective leadership. Providing feedback to colleague is also an opportunity to and use this reflection on a colleague as a chance to assess yourself against your own standards. Want more content and articles like this? Sign up for my newsletter below!